Drivers Ed Chapter 5 Review. 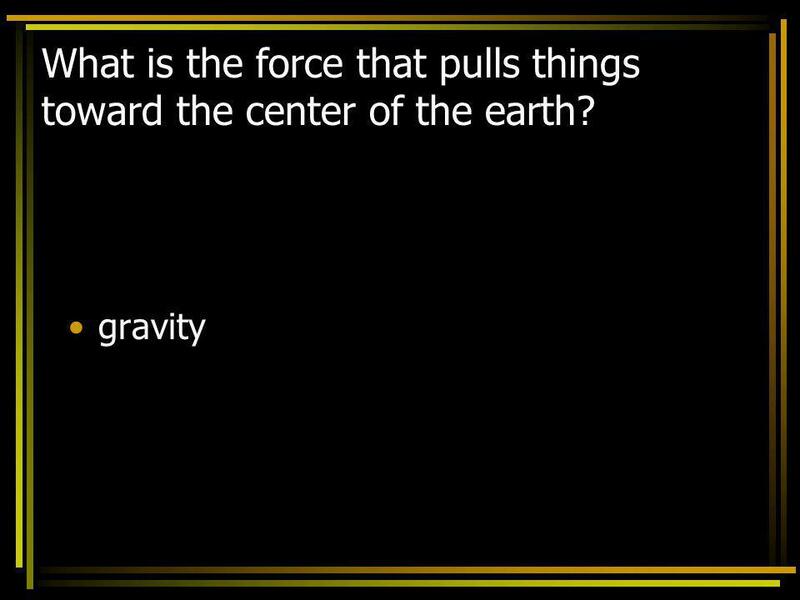 2 What is the force that pulls things toward the center of the earth? 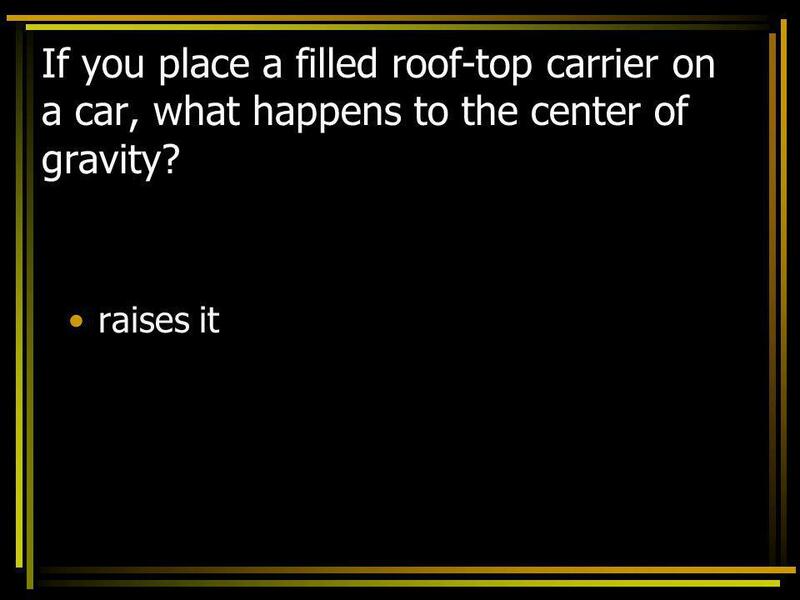 3 If you place a filled roof-top carrier on a car, what happens to the center of gravity? 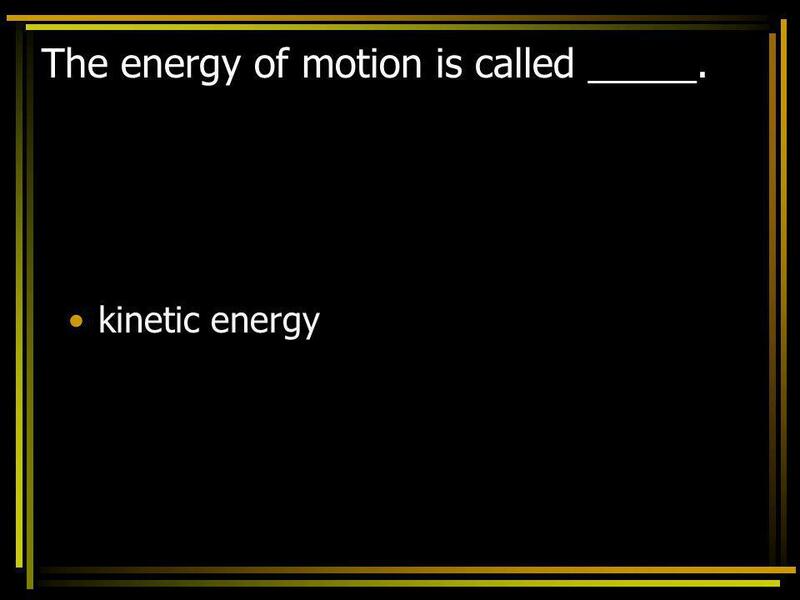 4 The energy of motion is called _____. 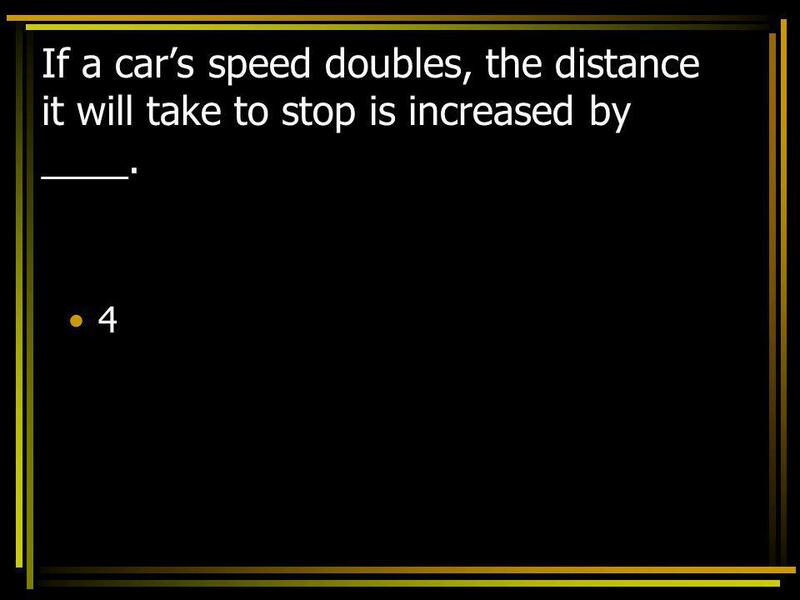 5 If a car’s speed doubles, the distance it will take to stop is increased by ____. 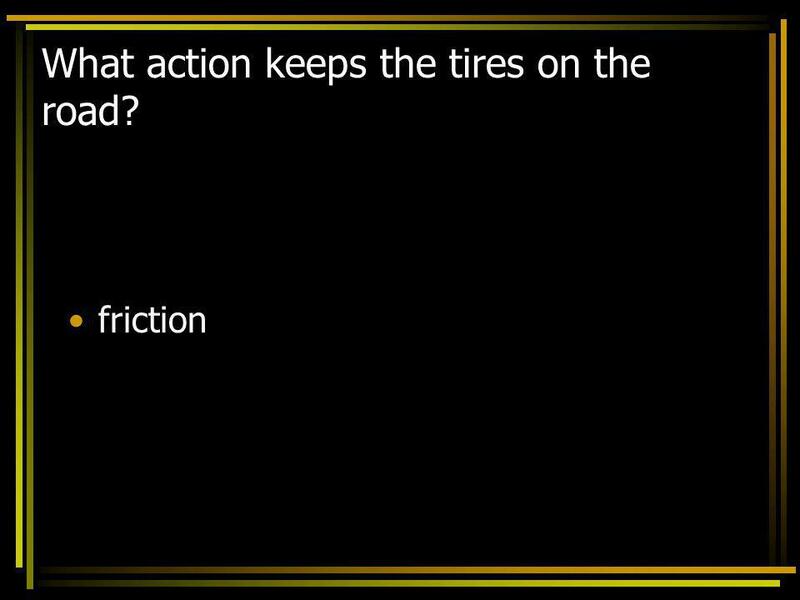 6 What action keeps the tires on the road? 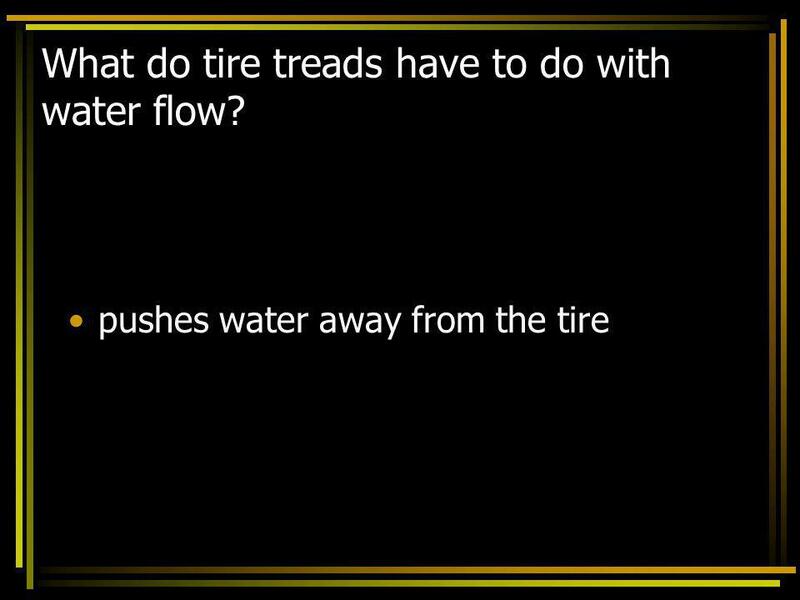 7 What do tire treads have to do with water flow? 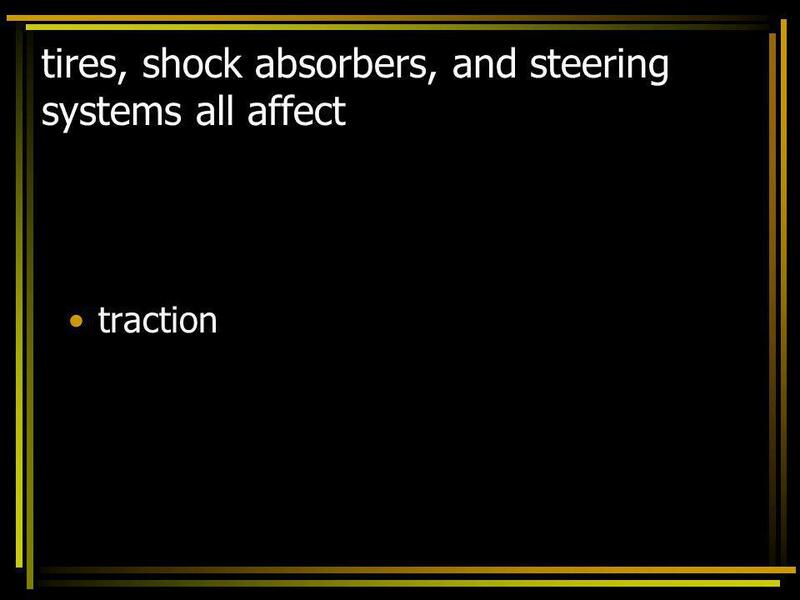 8 What do shock absorbers do? 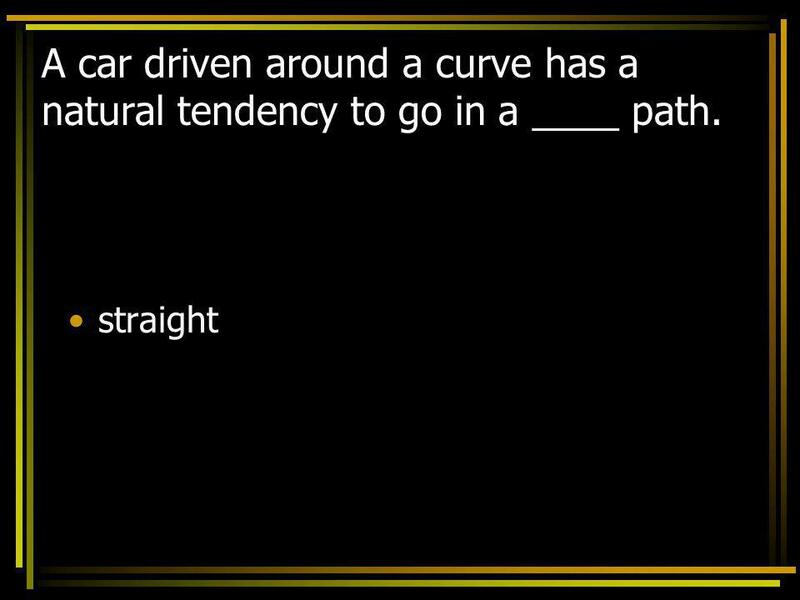 9 A car driven around a curve has a natural tendency to go in a ____ path. 10 The higher your speed, the more _______ is required. 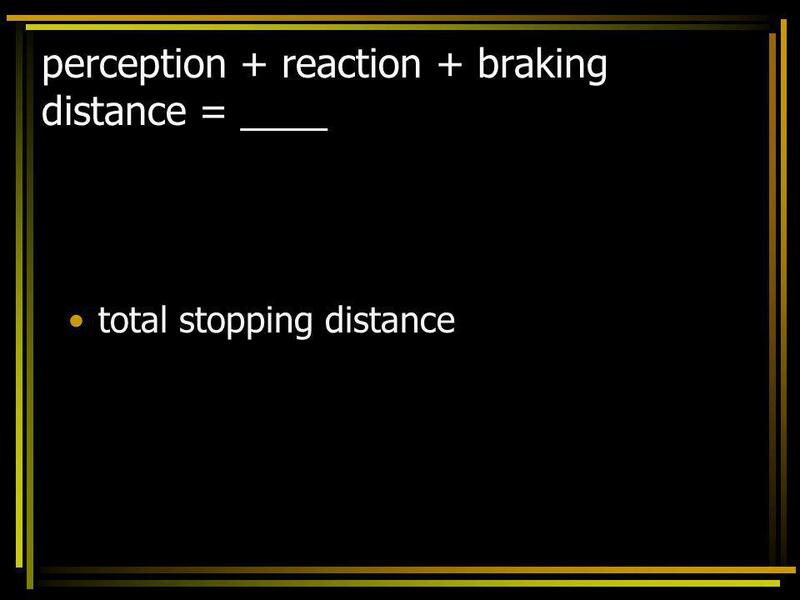 12 What happens to braking distance as speed doubles? 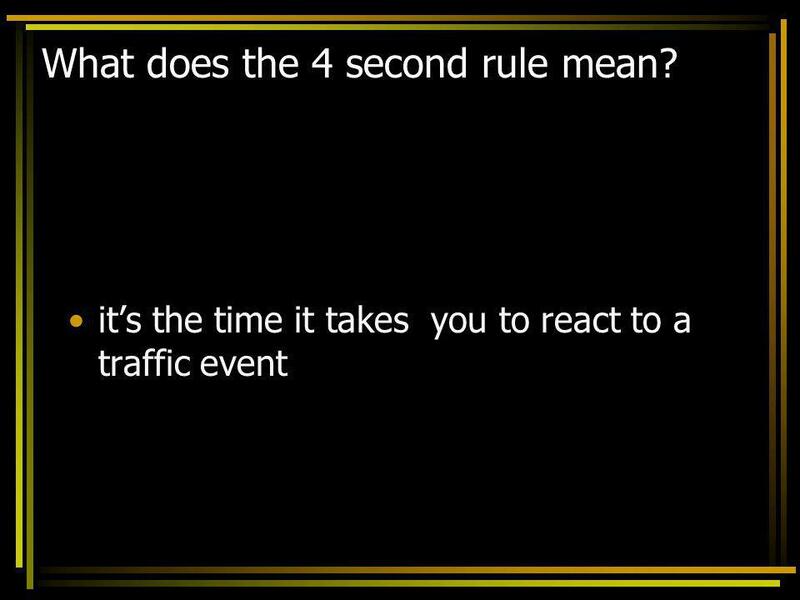 13 What does the 4 second rule mean? 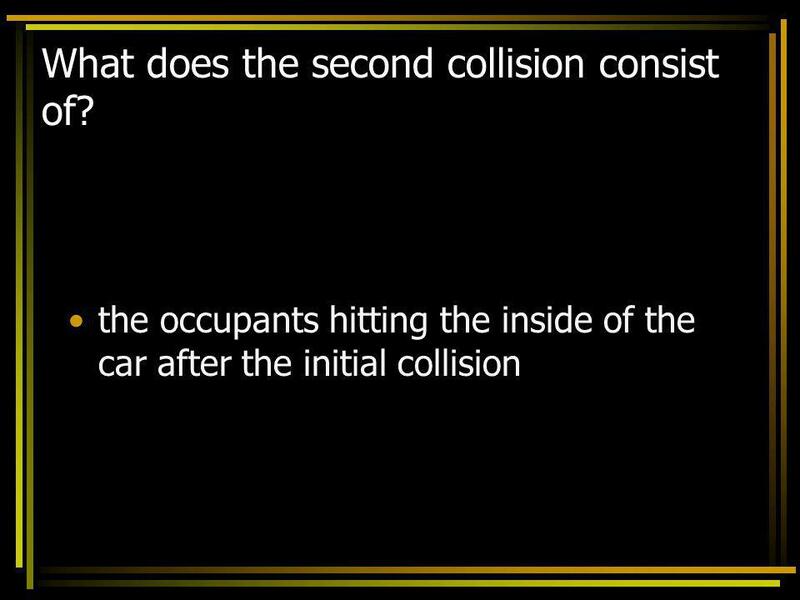 14 What does the second collision consist of? 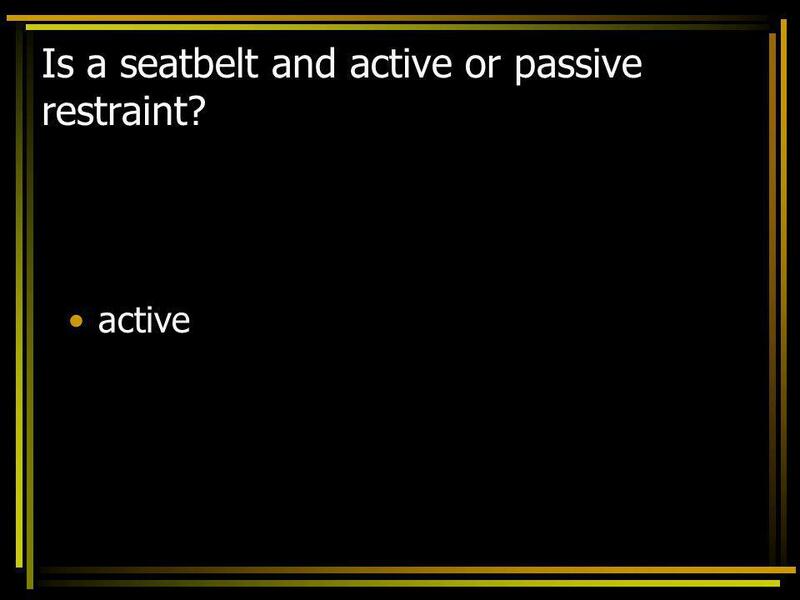 15 Is a seatbelt and active or passive restraint? 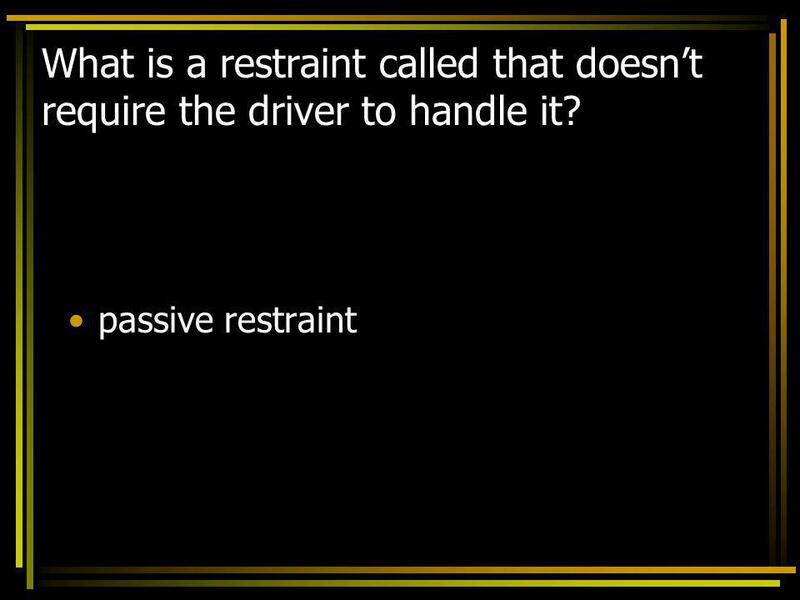 16 What is a restraint called that doesn’t require the driver to handle it? 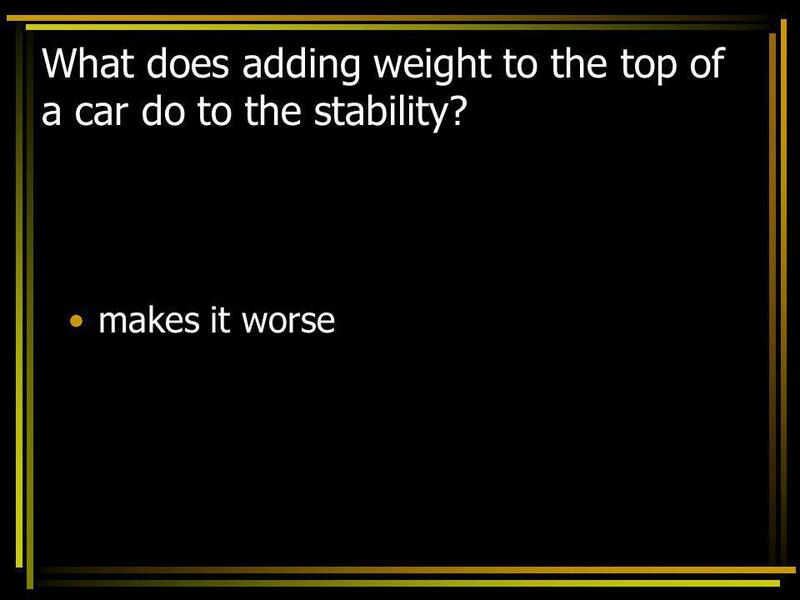 18 What does adding weight to the top of a car do to the stability? 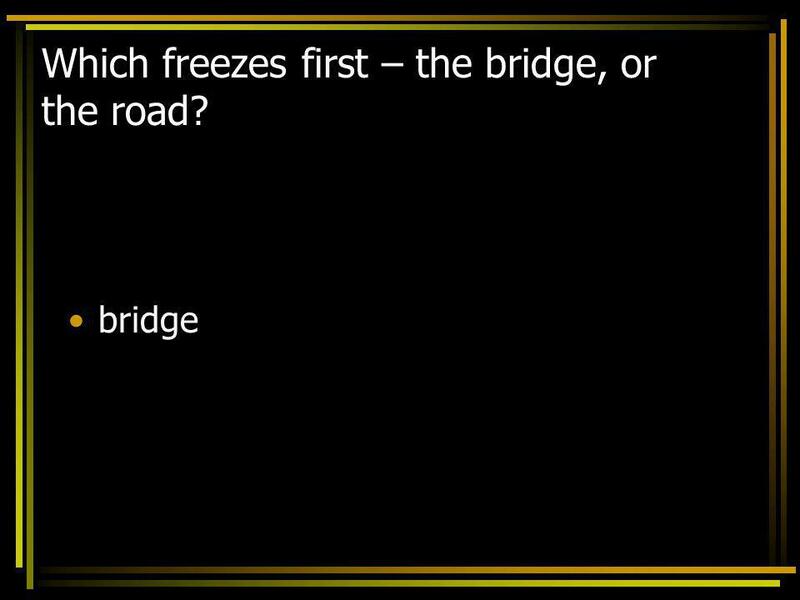 21 Which freezes first – the bridge, or the road? 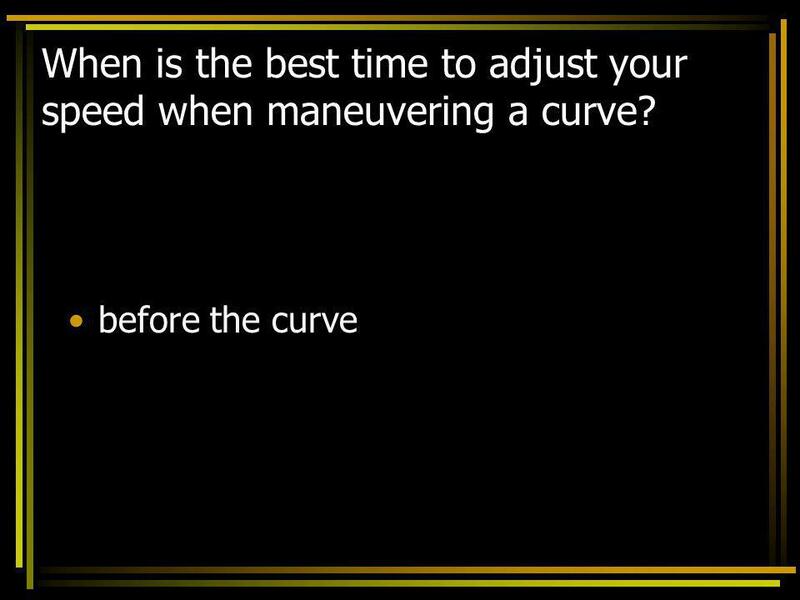 22 When is the best time to adjust your speed when maneuvering a curve? 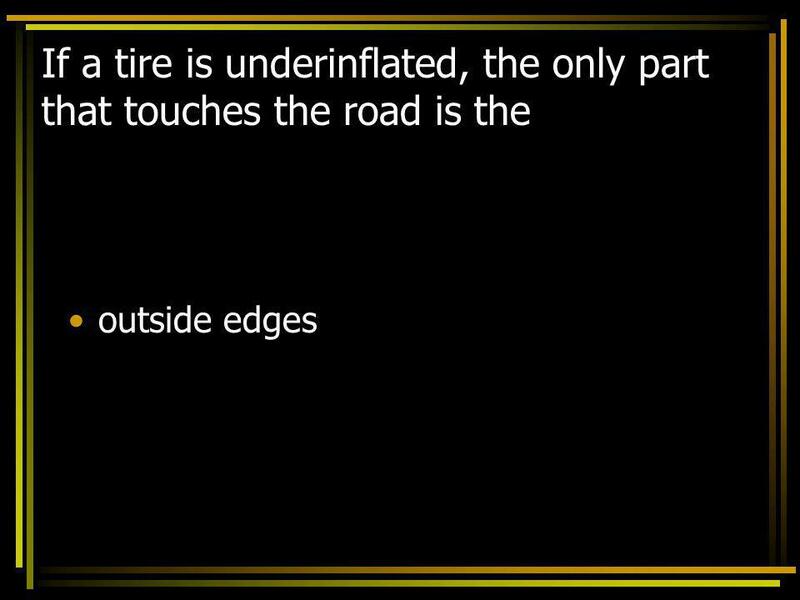 23 If your brakes are worn unevenly, your car will ____ during a sudden stop. 25 What are 2 things that help you maintain good traction? 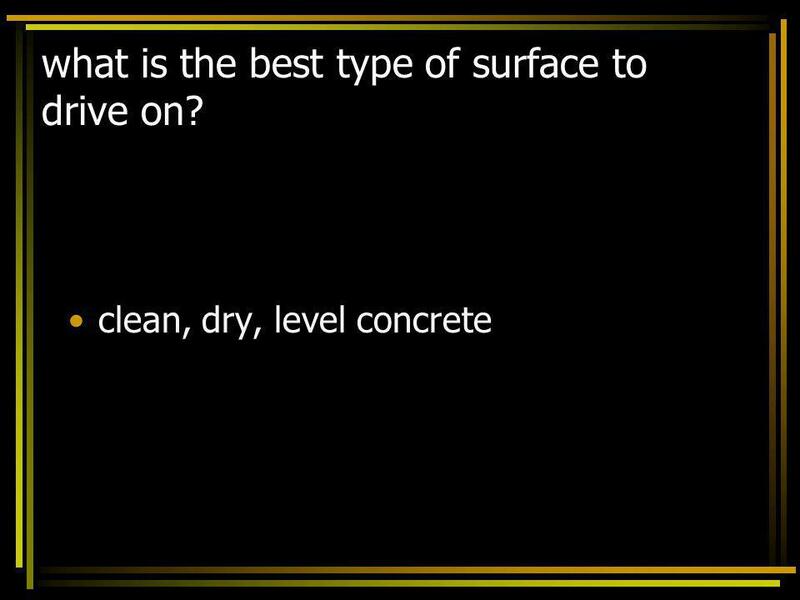 26 what is the best type of surface to drive on? 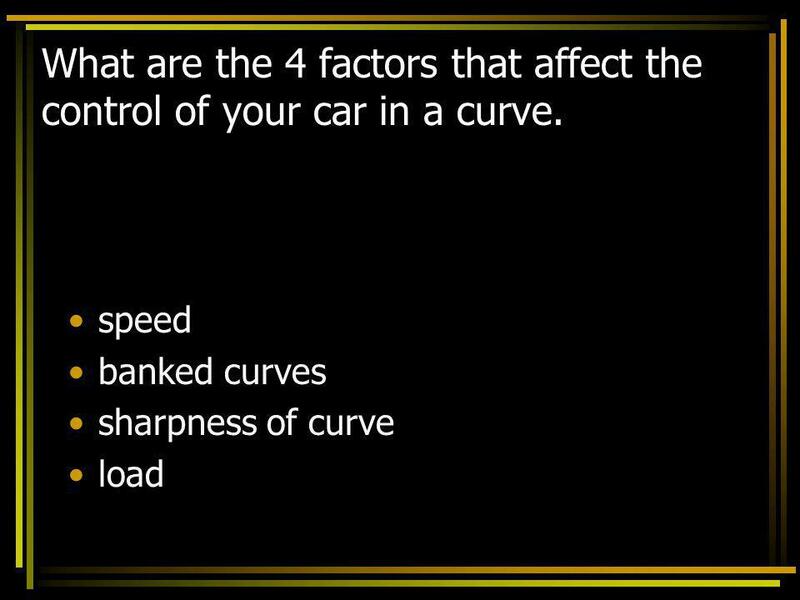 27 What are the 4 factors that affect the control of your car in a curve. 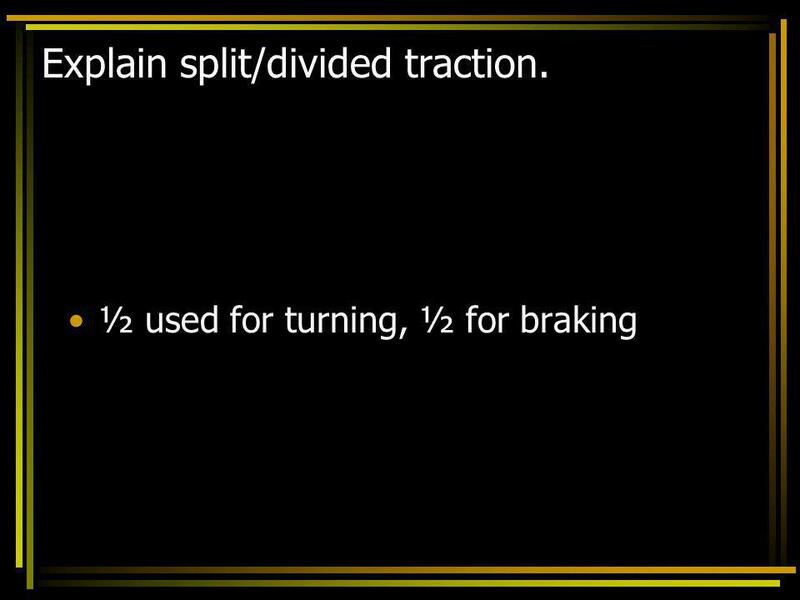 29 What are the 4 factors that affect braking distance? 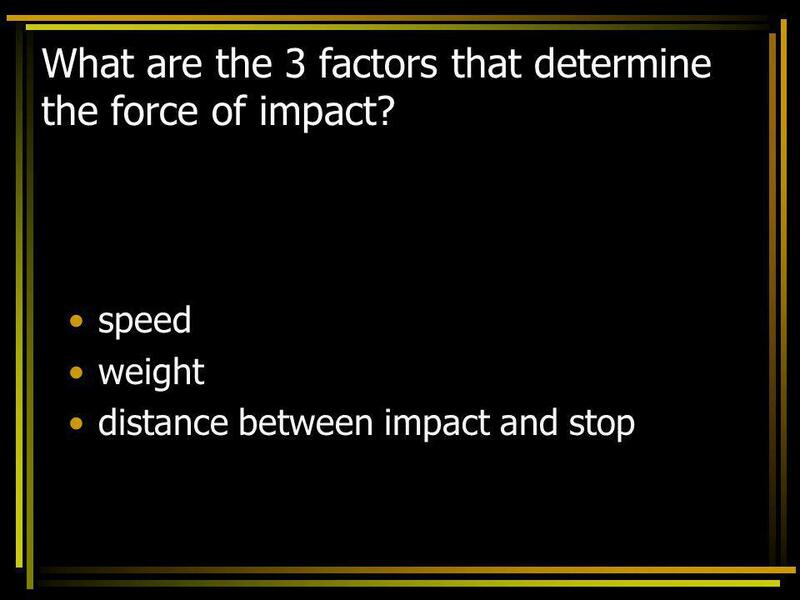 30 What are the 3 factors that determine the force of impact? 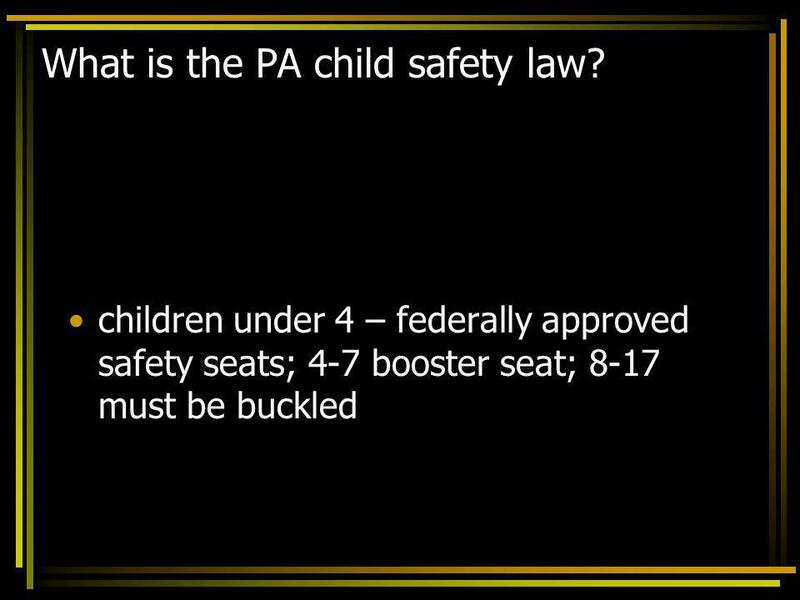 31 What is the PA child safety law? 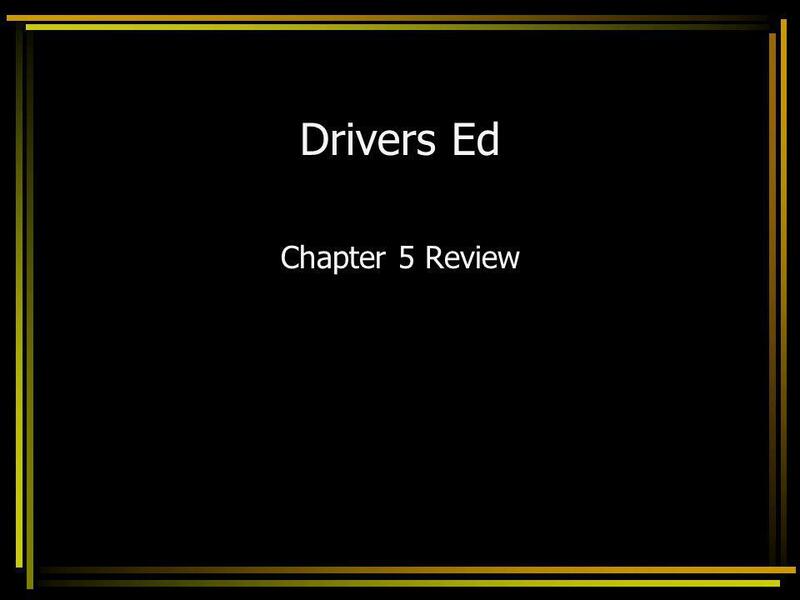 Download ppt "Drivers Ed Chapter 5 Review." Drivers Ed. Chapter 12 Review. 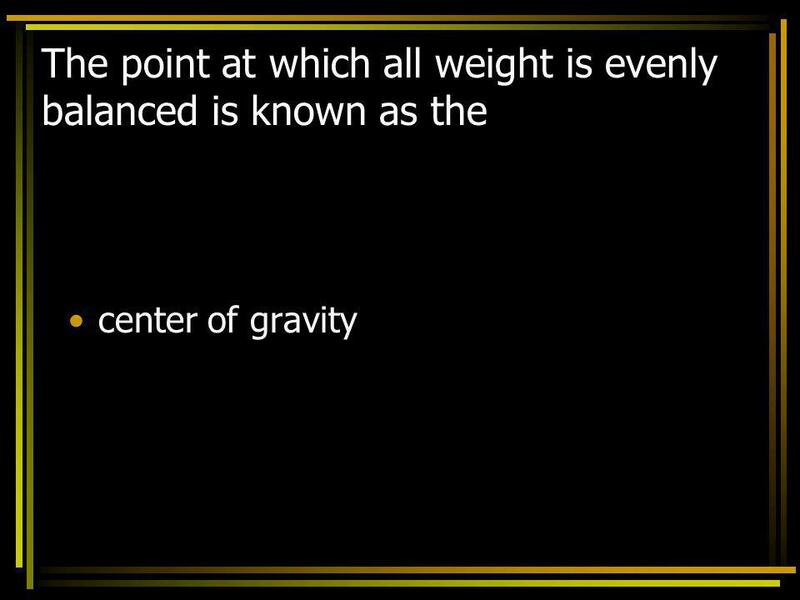 Unit 10 Natural Laws and Car Control North Carolina Driver and Traffic Safety Education Association1 NATURAL LAWS AND CAR CONTROL UNIT TEN. Chapter 3 DRIVER EDUCATION Miss Panno New Jersey Driving License System and New Jersey Driver Testing. Driver Responsibility Chapter 3 All Passengers must wear a seatbelt, as well as all drivers and occupants in a vehicle under the GDL Law. Lap Belt= Over. 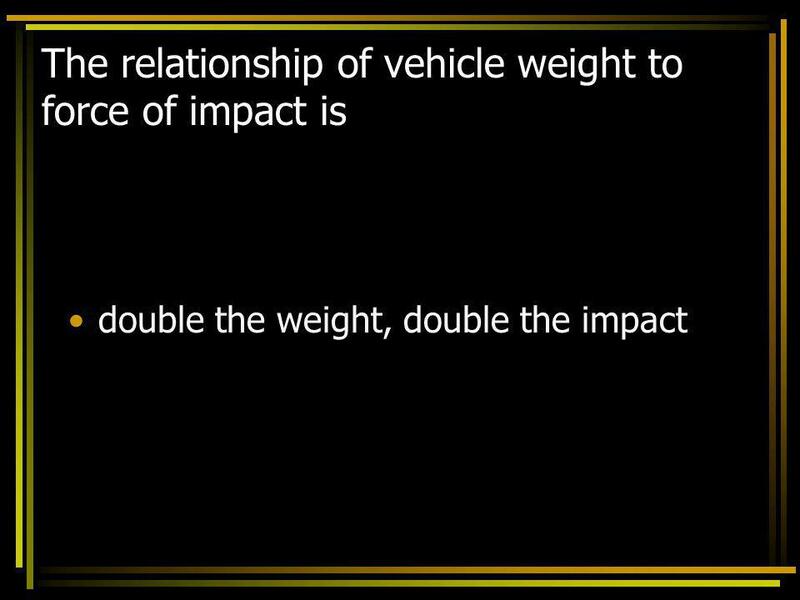 Drivers Ed Unit 2 Review. Driver Education Section VI Day 3 - Traction Concerns. AAA Kentucky Driver Training. Introduction decisions/mile 1 per sec) Decisions relate to adjusting time, space, and visibility within. Chapter 3 Driver Safety & Rules 1. The New Jersey seat belt law requires: All front-seat occupants of passenger vehicles operated in New Jersey to wear. Page 19.  WHO MUST WEAR SEATBELTS: o All occupants Front Seat = Primary offense o Back Seat = Secondary Offense o RESPONSIBILITIES: o For passengers. Driver’s Safety and Rules of the Road CH. 3. 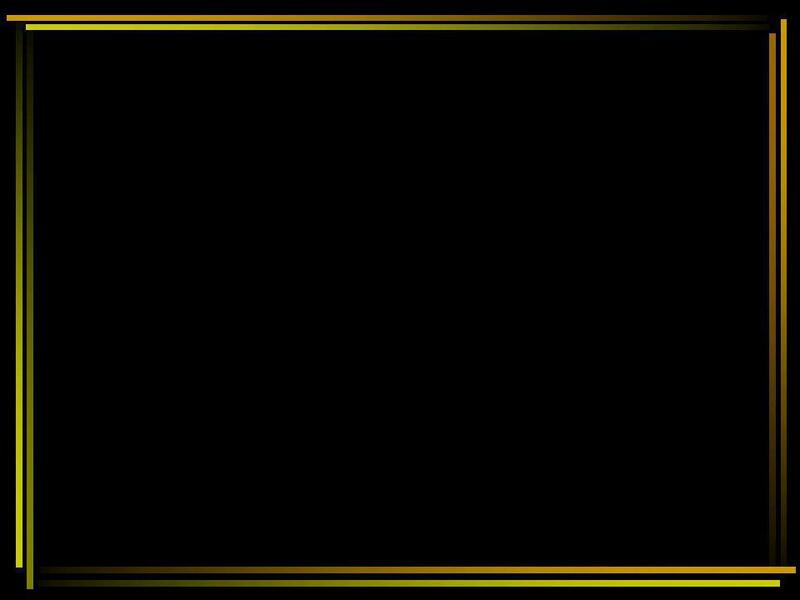 Seat Belt Law  All front seat passengers required to wear a seatbelt  Motorists are responsible for passengers.